SEATTLE – Once the scrum subsided, a visitor made his way over to Chad Barrett in the Seattle locker room after an introduction that could not have been more dramatic for the home side. Barrett scored off a wild scramble in the penalty area in the final moments of second half-stoppage time to give Seattle a 1-0 victory over defending champion Sporting Kansas City on Saturday in the Major League Soccer opener. 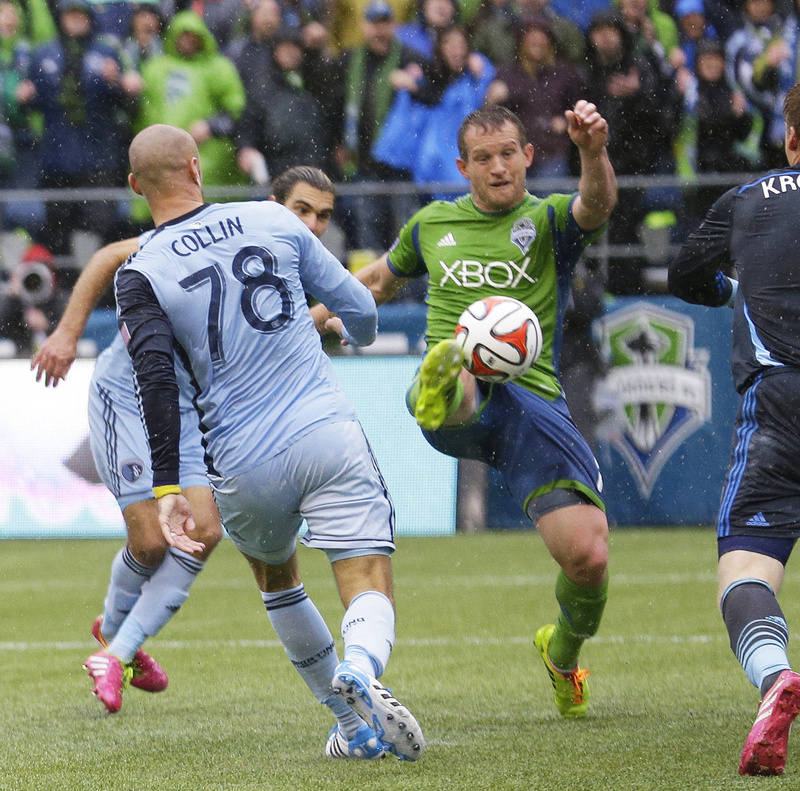 Seattle shocked Kansas City with a goal in stoppage time for the fifth time in the past eight matches. Barrett scored in his Sounders debut after Clint Dempsey’s header clanged off the crossbar and goalkeeper Eric Kronberg was caught out of his net. The goal was a stunning conclusion after it appeared Kansas City would be happy to open its title defense getting out of Seattle with a draw. Barrett’s goal started with a strong crossing pass by substitute Sean Okoli, but the play itself started after Sporting’s Graham Zusi committed a turnover in the midfield. Kronberg came out of the net to try and punch Okoli’s cross and the deflection allowed Dempsey a clear header. Dempsey’s attempt hit the crossbar but he was able to keep the play alive and get his toe on the loose ball. He was trying for a scissor-kick shot on goal, but it trickled forward far enough that Barrett was able to finish off the game winner. Dempsey came on in the 57th minute just a few days after playing 90 minutes for the U.S. national team in an exhibition loss to Ukraine in Cyprus. He was credited with an assist, his second since joining the Sounders. “Getting a goal in injury time does show that you’re fighting to the end. But it is a long season,” Dempsey said. It was the first match played with replacement officials after Major League Soccer’s referees and other on-field officials were locked out Friday. There appeared to be no egregious issues with referee Alan Kelly, other than the large number of fouls called. Kansas City was called for 25 fouls and Seattle 15. Both goalkeepers made their debuts as the No. 1 options for their clubs. For Kansas City, Kronberg’s first match as the successor to long-time starter Jimmy Nielsen (90 straight matches for KC) was a success for the first 93 minutes. He was peppered by chances throughout by Seattle. Stefan Frei wasn’t challenged as much in Seattle’s goal.